Authors: Han Fook Kwang, Angelina Choy, Cheong Suk-Wai, Jennani Durai and Cassandra Chew. SINGAPORE- When Singapore’s first Prime Minister Lee Kuan Yew had promised in the 1960s that 50,000 flats would be built in five years, the unenviable task fell on the shoulders of Mr Alan Choe, Singapore’s first town planner. “Back then, in Asia nobody had attempted so much high-rise building of such a scale, and in so quick a time,” said Mr Choe, 84. “We had no models to learn from.”So the architect planner at the Housing Board and his team improvised. Instead of using bricks, they used cement hollow blocks which were three times the size, so the buildings could be built quickly. They started with one-room, two-room and three-room flats. They exceeded the target and delivered more than 54,000 flats in five years, some of which were in Queenstown, Toa Payoh and MacPherson. 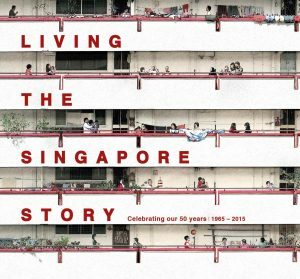 Mr Choe’s story, along with those of 57 others, is chronicled in the official SG50 book titled Living the Singapore Story: Celebrating our 50 years 1965-2015, launched by President Tony Tan at the National Library in Bugis in May 2015. Commissioned by the National Library Board and produced by The Straits Times Press, the book is a “people’s history”. It tells Singapore’s history from the eyes of 58 people from all walks of life, ranging from the late Prime Minister Lee Kuan Yew to a taxi driver, a satay seller and a retired domestic helper. Minister for Education and Chairman of the SG50 Steering Committee Heng Swee Keat said that the book chronicles the “small steps and great strides” of Singaporeans. These are “honest and heartfelt accounts that exemplify determination and fearlessness of Singaporeans”, he said. One of his favourite stories was of satay seller Ngalirdjo Mungin, 94, who started out only knowing how to make kueh. But he really wanted to make satay and hung around satay sellers and memorised their ingredients. He even innovated with his own techniques. Another story features Angel Ng, 50, who was jailed eight times but bounced back to be a call centre manager. Like her and Mr Ngalirdjo, most of the 58 story tellers featured in the book are unknown to the public. Led by Straits Times editor-at-large Han Fook Kwang, the book is co-authoured by Straits Times journalists Angelina Choy, Cheong Suk-Wai, Jennani Durai and former journalist Cassandra Chew.